Topic: My 5" garden railway. Re: My 5" garden railway. I think the shunter has managed to pick a fight with the garden rake. "What happened to good old fashioned shovels, wheelbarrows and elbow grease? You lazy little toe-rags "
Well, erm... They've just been upgraded! Like the look of the plan there mate. The baseboard looks like a nice solid construction! 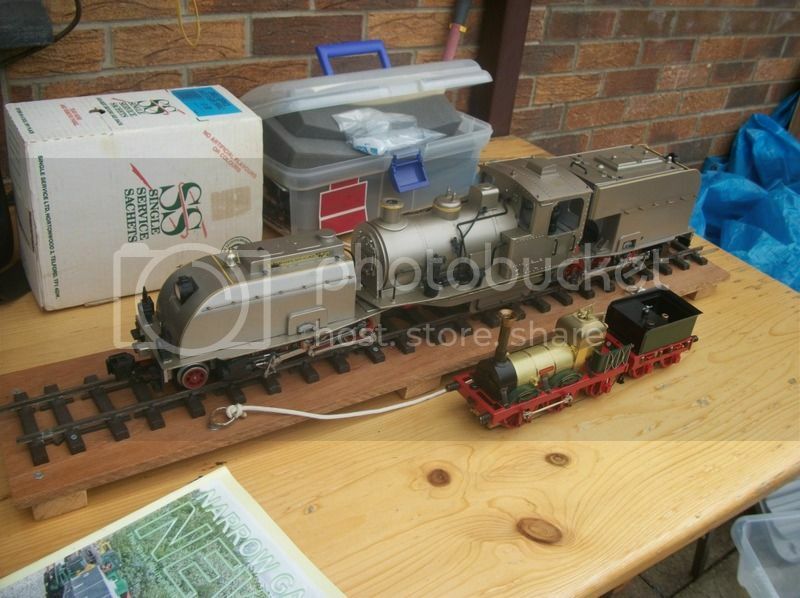 Can't wait to see trains rumbling around the layout. Is the Strathspey signal box based on one at the strathspey railway? I'm up in that area at the moment, lovely little line. Keep up the fantastic work on the kits mate, and I hope your problems go away soon. I think that something like 13 of them are getting refurbed.. Some of them on the Aberystwyth-birmingham line. From the outside, they look fabulous! compared to the boring silver ones, and the lighter green ones. Okay, Will look at them when I return from my adventure. Haha! Can't even keep time now... You don't seem to pay attention as much when they've been going past for the past 9 years... And when you can tell it's a special coming down the line because of the horn.... at various level crossings up the line.